Beautify CNMI! : Name That Abyss! 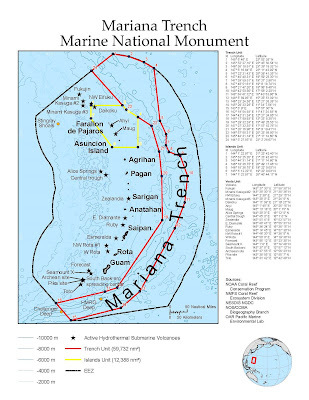 University of Hawaii professor and geologist Patricia Fryer and George Washington High School marine biology teacher and Marine Mania advisor Linda Tatreau are holding a contest to rename HMRG Deep, the second deepest place in the ocean. The contest is open to all Guam and Northern Mariana Island students ages 18 and under. The proposed name must reflect Guam's history, culture or language and the applicant must include a paragraph explaining the significance of the name. All entries should include the applicants name, school and contact information. The deadline to submit entries is July 14 to lindian@ite.net. The winner of the contest will have their chosen name on all bathymetric/geologic maps and will also get to ride on the UnderWater World float in the Liberation Day Parade, with a banner stating the winning name.